The repurposed machines carry a series of condensed novels, photo books, graphic novels and collections of poetry by local authors — all designed to be exactly the same size as a packet of cigarettes. The idea is to get people into the habit of reading as opposed to smoking. As smoking prevention plans go, I doubt it’ll be a roaring success, but I do like the idea of books on sale in the sort of unusual locations that cigarette machines might be found. I also like the idea that conversions like this are like miniature versions of what Bruce Sterling has taken to calling “stuffed animals” – relics of the past, stripped out and repopulated with the needs of the present. Cigarette machines, Victorian-era bank buildings… who knew there was a connection? 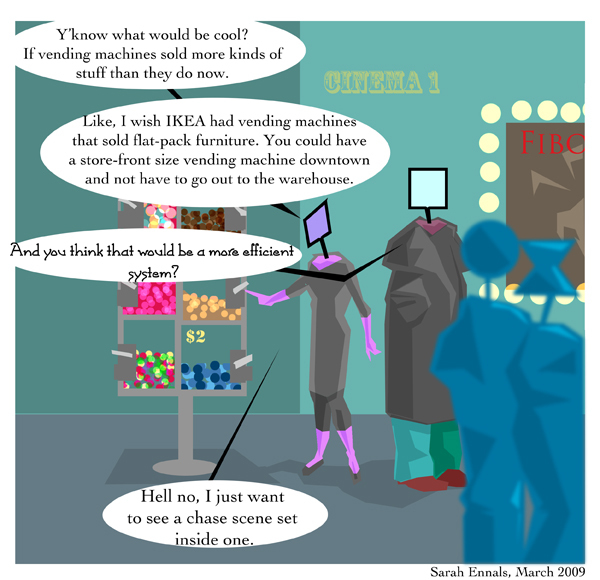 Does Not Equal is a webcomic by Sarah Ennals – check out the pre-Futurismic archives, and the strips that have been published here previously. NEW FICTION: WORLD IN PROGRESS by Lori Ann White: He vaults effortlessly to the smooth countertop and turns to the sea of faces. It’s soapbox time, ready to rant, but he spots a wake in the sea, Bouncer Babe tossing patrons aside, closing fast. He slaps at his waist, and feedback screams through the club. Everyone, including the bouncer, just–stops. All writing displayed or hosted on Futurismic is licenced under a Creative Commons Licence unless clearly marked otherwise or quoted under terms of fair use or similar. All images are attributed to their original creators as far as is possible.